Logs and firewood are a by-product from our busy tree surgery business. We recycle firewood from the timber brought back to the yard. Throughout the year, we constantly split and stack all of our best wood, leaving it to season for a year before cutting it to length as split logs / firewood. It is then cut to length and put into bulk bags ready for sale. It is ideal for open fires and for wood burning stoves in homes, pubs or for businesses. Treeservices is an environmentally friendly business and we aim to re-use as much of the timber that we process as we possibly can. Any timber not useable for the logwood trade is split and chipped and sold for mulch or to biomass power stations. None of it goes to waste. Our logs are truly recycled and we think they are the most sustainable form of heating fuel you can find. Our standard sized log is between 9”–12” long but special orders can be easily accommodated if you have a bijou wood burner or chiminea or an enormous inglenook fireplace. We deliver our dry (less than 20%), manageably sized logs direct to your door straight from our yard between Sevenoaks and Tonbridge and with our fleet of vehicles we can deliver anything from between one and six big bags of logs in a single journey to cut down on the number of trips we make. For open fires and wood burners we sell hardwoods such as Ash, Oak, Maple and Beech etc. If you have a wood burner then softwoods and logs that spit like Sweet Chestnut and Willow are ideal. It is a myth that softwoods tar the chimney and give off less heat; it is wet logs that do this and softwood gives off as much heat as hardwoods. We have been burning solely Conifer for years without any problems and find it as good as the hardwoods. It is much easier to light too. We also supply timber for biomass burners. We have a large store of timber that has been cut, split and stored and is now dry and ready to burn. It comes in various lengths from 30cm to 1 meter. 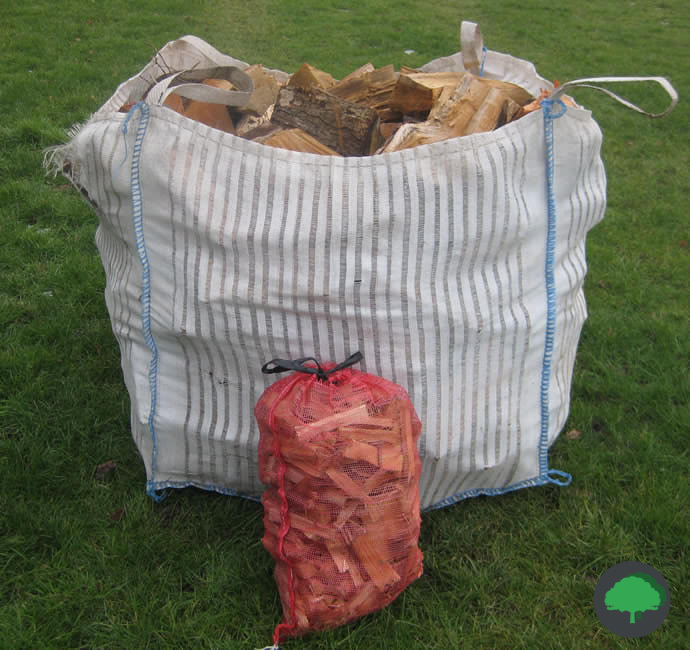 Logs are sold in bulk bags measuring 85x85x85cm. £10 surcharge per bag for extra small logs. Delivery is free within a 10 mile radius of our Plaxtol yard but £10 delivery on single bags. We can also supply fresh woodchips which are produced as a by product our day-to-day tree surgery and site clearance business. Fresh Woodchip can be purchased and used immediately for equestrian use, woodland rides and footpaths. 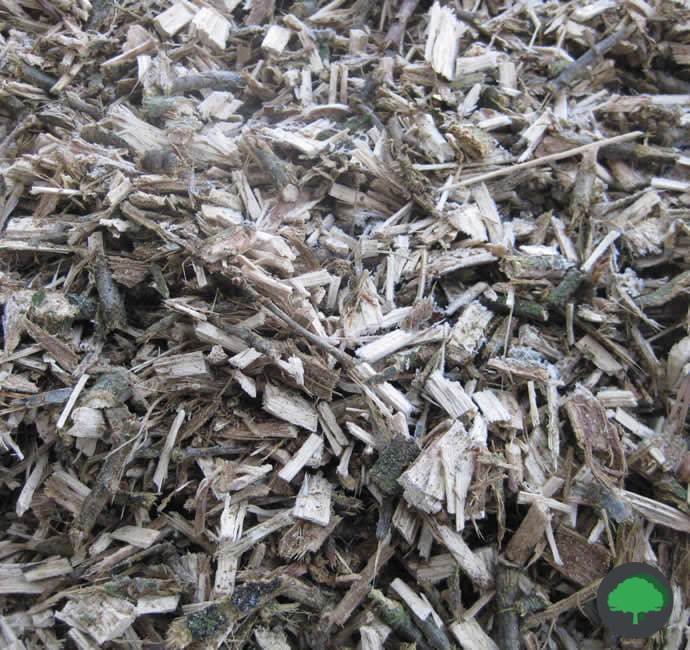 Woodchip mulch is available for use in horticulture and has various benefits to plants including prevention of weeds, reducing competition for light and water, reducing moisture loss and insulating the soil against frost. Woodchip mulch is a cheaper alternative to bark. Treeservices always have a good supply of woodchip available. It can be purchased delivered in varying quantities from 2 cubic meters upwards. Small loads can be picked up from the yard (by prior appointment). (sufficient to cover approx 20m² at 100mm/4" or 40m² at 50mm/2"). Stobart Biomass are our biggest clients.